BROOKFIELD PROPERTIES, the owners of Zuccotti Park, never imposed rules restricting the use of their space until Occupy Wall Street arrived. Only then did Brookfield prohibit (among other activities) “camping and/or the erection of tents or other structures,” “lying down on the ground, or lying down on benches,” and “placement of tarps or sleeping bags or any other covering on the property.” Standing before Justice Michael Stallman of the Supreme Court of the State of New York, OWS’s lawyers argued that Brookfield’s post-facto rules and the city’s enforcement of them—which entailed evicting their clients—were clearly intended to suppress First Amendment rights of speech and assembly. Justice Stallman disagreed. While repeatedly noting the belated nature of Brookfield’s rules, Stallman found those rules—and their enforcement by the police in the name of public safety—to be “reasonable,” and therefore compatible with the First Amendment. 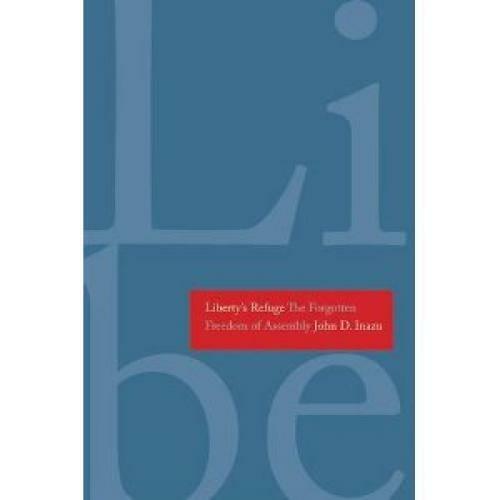 Both John Inazu’s Liberty’s Refuge: The Forgotten Freedom of Assembly and Timothy Zick’s Speech Out of Doors: Preserving First Amendment Liberties in Public Places investigate the disappearance of the First Amendment “right of the people peaceably to assemble” in contemporary America. Although Inazu and Zick wrote their books before the Occupation emerged, their histories help to explain—and even to justify—the Occupy Wall Street movement’s extreme mode of assembly: an assembly that insists on peculiar decision-making procedures, engages in twenty-four-hour protest, and refuses to cooperate with government officials and their permitting regimes. Zick’s contention is that the past several decades have witnessed the erosion of America’s “expressive topography.” By this clunky phrase, Zick means the “supply of material space” in which citizens are able to exercise their First Amendment rights of speech and assembly. Drawing on legal history as well as sociological and anthropological theory, Zick traces the increasing institutionalization of once-public space, as private land developers, public officials wary of dissent, and police forces crowd out normal citizens who desire to congregate and be heard. This closure of the public square perversely transforms protest—a lawful form of politics enshrined in the Constitution—into a dangerous act of civil disobedience. While Zick focuses on the external conditions without which assembly becomes impossible, Inazu’s primary concern is the internal composition of assemblies. For Inazu, to protect assembly means to protect groups of citizens whose political, social, and religious practices dissent from and even threaten politically correct forms of group behavior. In recent decades, however, the Supreme Court has shifted from defending the right of assembly to defending the “right of association,” a phrase that does not appear in the Constitution. The problem with “association” jurisprudence, according to Inazu, is that it offers “diminished protections for dissenting and destabilizing groups” by imposing very narrow definitions of what counts as political expression. One of Inazu’s bêtes noires is the recent Supreme Court case, Christian Legal Society v. Martinez (CLS). In CLS, the Court denied “the right of a religious student group to limit its membership to those of its choosing,” that is, to other Christians. What troubles Inazu about CLS is the way in which the government imposed its own pluralistic vision of a proper assembly on a group whose very reason to exist was to escape such pluralism. Historically, both authors contend, the function of assemblies in America has been to pursue and to exemplify modes of public life—such as suffragette conventions and civil rights sit-ins—that challenge mainstream social and political arrangements. But if the government can dictate the location and composition of each and every assembly, then there will remain only one kind of public life available to citizens—the kind that political officials and their police enforcers permit. Since colonial times, Inazu explains, Americans have assembled beyond the corridors of official power in order “to disrupt the polity,” to provide “a check against majoritarian standards,” and to resist “the attempt of government to control dissent.” While there were no First Amendment guarantees in the colonies, government forces were far weaker than most contemporary Americans can imagine. “At the time,” Zick explains, “there was no extensive bureaucratic apparatus—municipal ordinances, permit schemes, large police forces, and so forth—to regulate or suppress public contention.” When public officials called on the militia to disperse protesters, militiamen would often “refuse to report for duty.” As government grew, however, such assemblies became threatened by professional police forces and standing armies that deployed violence—or refrained from doing so—at the whim of the politically powerful. At the turn of the twentieth century, government officials routinely barred the people from meeting in public to discuss and to protest economic and political injustice. When groups were allowed to meet, officials restricted them to carefully watched “free speech zones” far from intended audiences. Zick points to one local ordinance that “barred labor activists from speaking within a 49-block zone in the heart of the city.” When protesters challenged this urban repression on First Amendment grounds, they found a stalwart enemy in the Supreme Court. In those days of laissez-faire capitalism, the Court insisted that public space should be treated as property owned by the government; just like a private owner, the government could forbid trespassers on its land. In the 1960s and early ’70s, however, civil rights activists pushed the boundaries of the Hague decision, assembling out of doors and sitting where they didn’t belong, often in violation of public safety and trespass laws. The Supreme Court responded positively to these efforts, reversing dozens of local convictions, including that of five African-American men who staged a silent protest in the “whites-only” public library and eighty-five demonstrators who protested school segregation outside the home of the mayor of Chicago. The simple fact that local officials found the use of public land by civil rights activists to be a threat to public safety did not give them the authority to disperse the assembled protesters. While the tactics of civil rights protesters “were generally peaceful,” Zick helpfully reminds us of how disruptive they actually were, attracting outraged crowds and paralyzing city centers. The solicitation of mob violence was a civil rights strategy, and officials often used the possibility of such a hostile audience reaction to shut down protest. In the ’60s, however, “the Court appeared to impose an obligation on police officers to protect public speakers rather than seek to suppress public contention based upon the mere possibility that violence or public disorder would occur.” The Court went even further in some cases, protecting even sit-ins at privately owned venues, such as segregated drug stores. In 1972, Justice Thurgood Marshall articulated the animating spirit behind these civil rights decisions when he wrote that the “right to use a public place for expressive activity may be restricted only for weighty reasons.” As long as the manner of the people’s expression was “compatible” with the normal use of space—reading at a library, eating at a diner, standing on a sidewalk—it would be unreasonable for the government to restrict such expression. These “reasonable time, place, and manner restrictions” have come to include complex systems of permitting. Today local governments generally require citizens to seek pre-approval and pay licensing and insurance fees before they may acquire a permit to assemble peaceably. As a result, those who want to protest the political status quo must ask those who maintain the status quo for permission to do so. The government’s “prior restraint” of speech is the oldest and most obvious example of a First Amendment violation. Yet today, those who march down a city street are declared lawless until they pay and persuade the right government officials. This bureaucratic control of assembly enabled by permit regimes has been exacerbated by what Zick calls “militarization,” “a new form of public protest policing” that seeks to control “public places and public expression through repressive measures like expressive zoning, surveillance, infiltration of protest groups, mass arrests, and use of force.” Such militarization has rapidly accelerated in the wake of September 11. Meanwhile, the nature of the threat to public safety posed by the protesters’ syncopations—which wafted over from Fifth Avenue, where the musicians had been corralled—remained unclear. This moment of “expressive zoning” provides a perfect example of the privileging of property over protest that the American legal and political establishment has enforced since the late 1970s. It is certainly reasonable to doubt whether the Occupy Wall Street movement’s peculiar approach to deliberation, organization, and physical space offers an immediate practical alternative to the United States’s current political economic system. But it is quite clear that the movement’s baroque methods express a critique of that system. This is what Inazu means when he writes that the composition and the leadership structure of an assembly are “themselves forms of expression,” deserving of judicial protection. Yet today permit regimes and expressive zoning impose what Timothy Zick calls “a hierarchy of command” on assemblies that stifle their experiments with novel forms of collective expression. Jeremy Kessler is a JD/PhD student at Yale Law School and Yale University’s Department of History, where he works on the history of conscientious objection. He has written for n+1, The Los Angeles Review of Books, and The New Atlantis, among other publications.